Ready to buy. 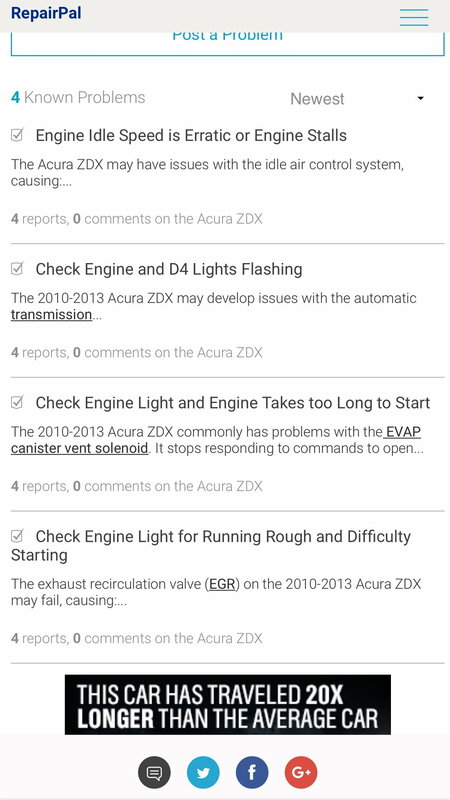 Are there any things SPECIFIC to the ZDX I need to look for when evaluating at used zdx vehicles? I already know about timing/water pump. And I know how to generically look at used. - inspect the vehicle's body panels for all matching vins. - lift the vehicle and inspect the under body and suspension components... looking for broken or cracked bushings, loose or backing out bolts or nuts, etc. etc. etc. - hook up OBDII reader to read for any codes. - inspect the vehicle for funny wear. - etc. etc. etc. for all that comes with inspecting a car for broken things. if you cant do this; take it to a mechanic who will inspect the car under a pre-purchase inspection... The mechanic will then tell you what may be wrong or up coming problems that may occur...he'll be able to tell you if the car is a good buy or not. Something to consider: Low-mileage examples sold by Acura dealers usually come with quite a comprehensive Acura-sponsored warranty package. There are so few on the market. Fewer close to home. I really hate to buy something without first putting my hands on it. I am looking more toward the lower end of the market 2010, 70k to 90k miles trying to keep my cost low. With the exception of my mortgage, I have been debt free for 14 years. . 4 cars mine, my away from home car, Wifes and my Sons. No payments on any of them. I do expect to have some debt with the ZDX but intend to keep it as little and short-term as possible. I know what to look for when buying a used car. My father has been a dealer for 52 years, and I have for a short time, been a salesman. Every car model has unique quirks, specific parts that fail prematurely or difficult to overcome issues. That is what looking for with this post. Research and patience are the best friends of a good deal. Yep, I would second that. So far my ZDX has needed a starter, radio assembly, sway bar links, rear shocks, and now it's throwing CMBS error codes. Agreed that is how I purchased my 2013 in Nov 2018. It had just 37,000 and was a CPO. Of course that all comes with a hefty price tag. However, I've very happy with my purchase.